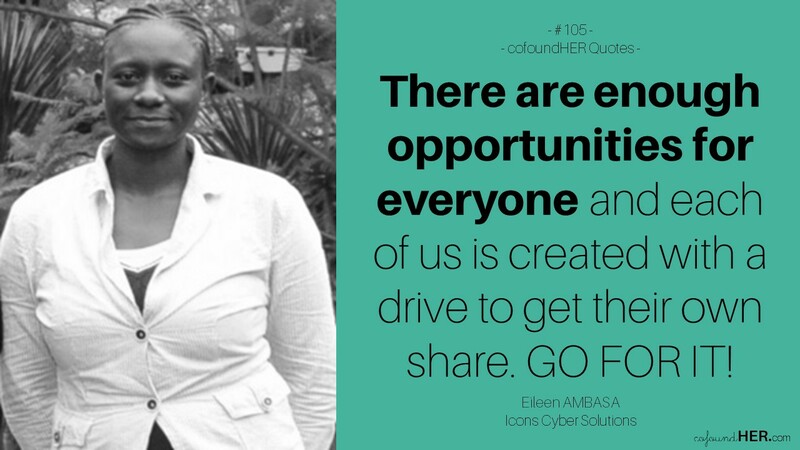 Three years after graduation and with a one year old baby in tow, Eileen Ambasa got interested in Information Technology (IT). Seeing the opportunities it could open up in her career, Eileen decided to learn IT basics. So, she enrolled in ACWICT, a college that teaches IT essentials to young girls in partnership with Samsung, where she learnt CISCO, customer care and business process outsourcing, among other things. Not long after she completed that programme, she was employed at Techno Brain Kenya as a Computer Networking Instructor and rose through the ranks to become the Training and Operations Manager. In April 2013 she decided to exit and become a consultant. There, her journey as an entrepreneur began. A graduate of Arts Economics and French from Kenyatta University in Kenya with a diploma in German language from Goethe Institute, Eileen Ambasa has a wealth of varied experience and skills — from being a language tutor, to serving as the Internal Auditor at Students’ in Free Enterprise (SIFE), helping young teenage girls initiate and develop small businesses of their own, and now starting her own company, Icons Cyber Solutions. Eileen is passionate about learning new things, being a good mom to her six year old daughter, and helping others learn so they can develop themselves. She reads self-development books, researches on information security matters, loves cooking, and enjoys insightful discussions especially with her family. Tell us about Icons Cyber Solutions and how it would change the world. Icons Cyber Solutions is an information security and computer forensics company. We help businesses and individuals tackle the dynamic technological and information challenges to securely integrate IT into their businesses and lives. We seek to combat cyber crime and fraud incidents that affect confidence in our economies and in businesses. We also aim to tackle the shortage of field experts by empowering and equipping youth in society, especially in Africa, with the necessary skills that will enhance this industry’s growth. Why did you decide to start Icons Cyber Solutions? I wanted to start something sustainable that would make money for myself and future generations, and also create employment for others. Having worked as a consultant for a while, I wanted something other than earning money in percentages that would make use of my expertise. I was offered a chance to start a branch of a Ugandan company in Kenya; that did not go so well and in the process, I got contacts that required a registered business. That’s how Icons Cyber Solutions started. The name of my company has evolved three times; at one point it was Infoseek. How did you get interested in technology? I got interested in technology after my daughter turned one. I was still jobless so I decided to try it out, especially when I realized that some of my former classmates who had changed courses from Economics to Computer Science were doing so well. There was a time I could not even hold a mouse and I merely survived a retake in my computer course in my first year at campus. But I improved greatly. Once I was top of my class for IT essentials, I began to see that with interest I could advance. Since then, I have not looked back. What do you think women in technology need? Mostly focus and to lose the dependency syndrome on our male counterparts. We need to put ourselves out there in this industry, have the drive and a goal (whether clear or unclear), learn, go the extra mile in putting our technical ideas into businesses and run them as the good managers that we naturally are. What is your advice to a woman thinking of going into technology? Go for it. Absolutely. It is nice and fun. Be passionate about it. Get into the field not just as a career but as something you love. Have a learning attitude and be able to multitask. Technology changes; put in time for research and continuous learning so you do not become stagnant. It is not easy, but it can be done. Do not look at yourself as a woman, or even as a man, but as a human being. This way, one realizes that we are neither in competition for anything, nor is one person more privileged than the other. There are enough resources and opportunities for everyone and each of us has been created with a drive to get their own share. GO FOR IT! Only you can dream your dream so only you, through God’s help, can make that dream come true. What was the most difficult part about applying for the Tony Elumelu Entrepreneurship Programme (TEEP) and how did you feel when you heard you made the list? Filling the form was so challenging since it had several sections and requirements. Other fields also took a lot of time and attention, which was pressurizing. I just kept encouraging myself since nothing good comes easy. I think it was all worth the effort and time. When I heard I made the list, I was excited of course! I had no clear idea what it entailed, but the fact that there were over 20,000 applicants and only 1,000 were selected in Africa (not just Kenya) and I was among them! That is just mind blowing. I was jumping up and down in the living room with my younger sister, our eyes filled with tears of joy and we couldn’t stop thanking God for this great opportunity. It was an emotional moment for me, a good one. What is your number one business challenge and how do you think the programme will help address it? A more organized and business oriented approach in our company. I must admit that most techies are not so good in business, despite having great talents and skills. TEEP has already got me thinking of how to handle these challenges. I’m now paying a lot of attention to detail and I believe that by the end of the programme, I will be able to apply the knowledge acquired and have strong structures in place. I believe the business will grow to greater heights and be sustainable, plus with the network already formed with fellow participants, there is great potential for further growth, greater impact to society’s businesses and awareness creation to communities that will be of great value to me. Any words of encouragement or advice to entrepreneurs like you? Sure. Whatever your mind can conceive and believe, it can achieve. Do not be afraid to fail or make mistakes; as long as there is action, they are bound to happen. The most important thing is to get back up, and to come out wiser and stronger than you were the previous time. It doesn’t matter how many times you get up and fall, just keep going. It is a great learning experience. We are sharing the stories of 30+ African women entrepreneurs who are beneficiaries of the Tony Elumelu Entrepreneurship Programme. and whose ideas can change the world. Follow the TEEPcofoundHER series HERE.